This past holiday season, the Microsoft Store wanted to hear what mattered most to local communities through its Wish Machine. The Microsoft Store received more than 6,000 heartfelt requests and granted more than 100 wishes nationwide. The power of each wish granted is impacting communities, inspiring possibility, and helping others. Marie Paul Jeanty and Regina Mitchell (center) accepted the Microsoft Wish Machine prize, including computers and tablets valued at $3,000, on behalf of the children and youth of HeartShare St. Vincent’s after-school programs on January 10, 2018 at the Microsoft Store at the Roosevelt Field Mall in Garden City, NY. 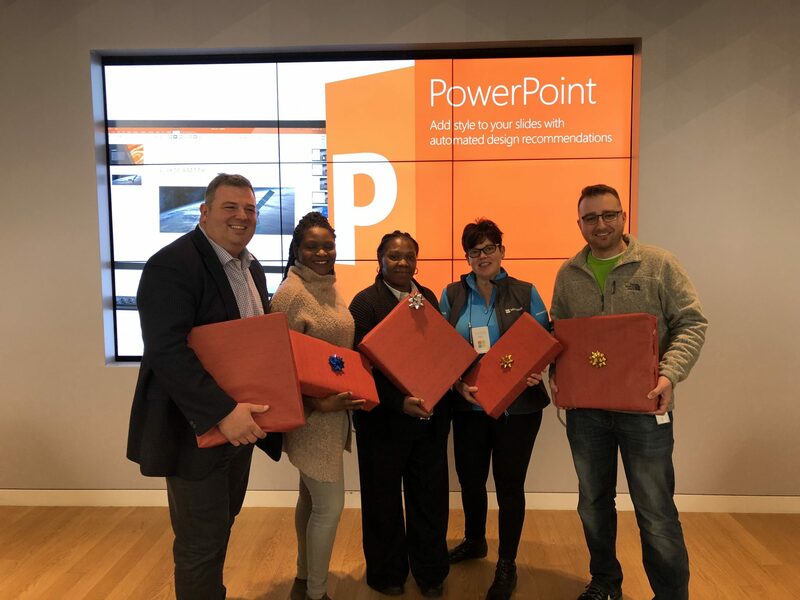 Joe Ogno, Managing Director of Office Interiors at QUADRA Furniture & Spaces, a New York-based furniture rental and staging company, was at the Microsoft Store in Garden City and thought to nominate HeartShare St. Vincent’s Services. Joe was recently introduced to HeartShare St. Vincent’s through QUADRA’s work furnishing the HSVS Wyckoff Cornerstone Program in downtown Brooklyn in fall 2017. “It felt amazing getting Microsoft’s call telling me that my wish to help our partners at HeartShare St. Vincent’s won! We saw how much the children and senior population at the Wyckoff Gardens Community Center benefitted from our #QUADRACares refurnishing project. It was clear that HeartShare St. Vincent’s could put this newly donated Microsoft technology in the hands of those who need it most. So grateful to take part in another effort to design spaces to thrive,” Ogno said. Through the Microsoft Wish Machine contest, which ran from November 28-December 31, HeartShare St. Vincent’s Services received $3,000 in hardware, including four Dell Inspiron 13 i7 8g 256 devices, and two Asus Vivo Book Flip 11 devices. “I think this is a great program that helps people not only think about the needs of others but also provides an opportunity for us to articulate that need, act on it and make others aware of it as well. Even if a wish is not granted, at least some level of attention may have been brought to a worthy cause,” noted Jason Ward on the Windows Central blog. “Together, we’ve created a beautifully designed, technology-rich environment for our kids. Thank you so much to Microsoft and our valued partners QUADRA and Habitat for Humanity,” Rosenthal added. The HSVS Cornerstone & Beacon Programs throughout Brooklyn offer tutoring, recreational activities, creative arts and sports to children and youth, as well as have programming for adults.